I've volunteered to use some of my Cthulhu reputation to sponsor a Christmas/holiday contest. 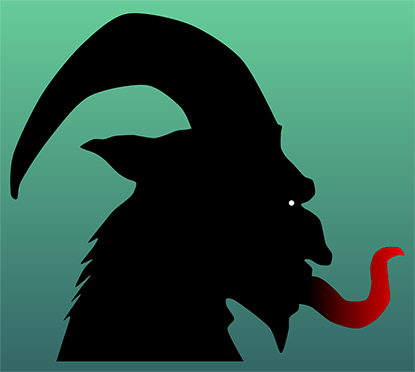 You all have aced previous holiday questions, so I'm going to give you a bit more of a challenge: Draw me Krampus, the Krampus is a beast-like creature who punishes bad children at Christmas. I'll judge the entries myself and award the one I like the most and award it a bounty of 500 reputation as the grand prize. Pure TeX. Only TeX may be used, no LaTeX, ConTeXt, Lua, etc. Extra credit if you use a really old version. No fancy graphics packages; no TikZ, pgf, PSTricks, pst-plot, Metapost, Asymptote, etc. The best Krampus you can using things not designed to draw things. Technical achievement; This will be voted on by a committee of volunteers from respected communities members (as I'm not qualified to judge it) and will be awarded to the most impressive use of *TeX, regardless if it is the best looking. Finally, the people's choice award will go to the most upvoted submission as of the close date. I'm going to give this a tentative date of the 21st, but that may be subject to change if I'm in transit that day, or I can't set the bounty to run that long. You have to draw the whole thing in some member of the TeX family; no using import graphics. The goal is to have fun, so don't try and weasel around any restrictions. ASCII Krampus, run with xetex. I used an image I found via Google image search as the base. Not the answer you're looking for? Browse other questions tagged diagrams fun or ask your own question. TikZ: How can I write my code more concisely? Is pict2e a replacement for picture? reference for drawing ramification figures?